SANTA ANA, San José — Just south of Lindora’s Miami-style “Golden Mile,” past the coming-soon Maserati dealership, the Quizno’s, the Taco Bell and the Caterpillar lot, there’s a centuries-old village anchored by a church built in 1880, right next to a classic fútbol field. Many historians believe Santa Ana was home to the first Spanish settlement built in Costa Rica’s Central Valley, in 1561. Today it is among the most modern, wealthy and cosmopolitan neighborhoods in the country, with high-end shopping malls, gourmet dining and a championship golf course. Drive just a bit further south, uphill past Salitral, and you’ll see chickens crossing the road on a grade so steep it will strike fear into your heart, though you’ll marvel at the stunning views of the valley below. 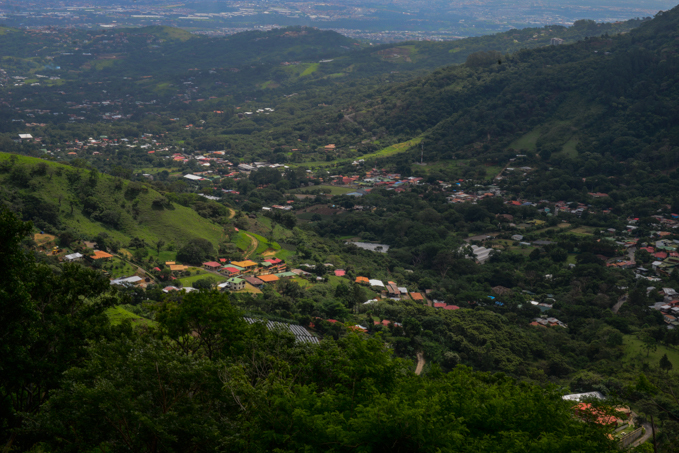 Welcome to Valle del Sol, a name officially adopted by the canton of Santa Ana in 1971 — home to millionaires, onion farmers, traditional pottery makers, urban professionals, a growing number of expats and Costa Ricans of all descriptions. The Tico Times has chosen Valle del Sol to launch a new series called “Costa Rica’s Least Known Greatest Places” — destinations that are genuinely worth visiting but are off the beaten tourist track. In upcoming articles, we’ll be looking at the history of this valley, visiting two animal sanctuaries and a local pottery factory, exploring why it’s such a popular place to buy or rent property, and meeting some of its local personalities. Location: It’s outside San José but not too far outside, close to the airport but an hour from the beach. Climate: It’s warmer and drier than Escazú or San José, but not as hot as the coast. Nature: Green space abounds in the nearby hills, though you’re minutes from the glitzy malls. “It still has the charm of a pueblo,” said Volker Alsen, the German travel writer who owns the Posada Nena Hotel in Santa Ana, along with his Venezuelan wife Minerva. “It has its market on Sundays. There’s always lots of activities, there’s always live music on the streets. 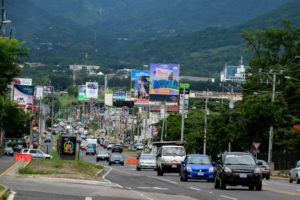 Gerardo Oviedo, the three-term mayor of the municipality, said Santa Ana is reputed to have the second-best climate in Costa Rica (after Atenas, supposedly). “Some people call Santa Ana a city on the beach, only we don’t have the sea,” he said. For travelers who are new to Costa Rica, Valle del Sol can be a cultural bridge between the comforts of Europe and North America and the more rugged, less air-conditioned Costa Rica. You can easily find friends here who speak English, and even more who can help you learn Spanish. Opportunities abound for shopping, dining and sight-seeing, and it’s a short trip to the country’s main international airport, the capital and the Pacific coast. 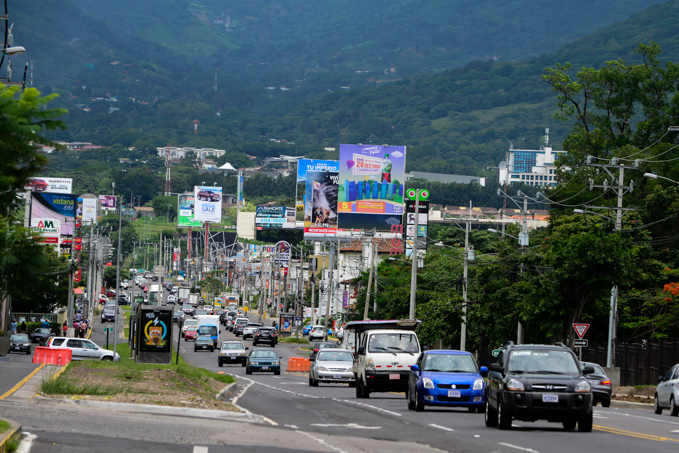 It doesn’t hurt that in the United Nations’ 2016 Human Development Index for Costa Rica, the canton of Santa Ana ranks No. 1 in the country, based on life expectancy, education and living standards. Santa Ana also has some of the most prized real estate in the country. The last president, Laura Chinchilla, lives here at Villa Real, said to be the nicest condominium complex in Costa Rica, and well-to-do expats of all stripes have flocked to the area. Like any city, Santa Ana has its problems, including persistent traffic jams, drugs and crime. Mayor Oviedo said Santa Ana has attracted a lot of residents with big buying power, with condominiums and deluxe homes, and this has attracted thieves. “We’ve tried to remedy that with the Municipal Police, installing cameras, working more closely with the Ministry of Public Security, but still there’s a perception of insecurity,” he said. Santa Ana retains its small-town Costa Rican quirks, as illustrated in an anecdote related by hotel owner Alsen. He pulled out a homemade 2010 map of Santa Ana, which he says was accurate at the time, with Avenida Central running along the north side of the central church, and Avenidas 1, 3 and 5 to the north and Avenidas 2, 4 and 6 to the south. But Google Maps came out with a map that placed Avenida Central along the south side of the church, with all other avenues thrown off by one block. So the city of Santa Ana, according to Alsen, rather than tell Google to correct its maps, put up new street signs to match what Google said! Mayor Oviedo disputed that story somewhat, saying that while there might have been some confusion about which street was Avenida Central, the final decision was made by the national post office. The street signs went up just a few months ago — yet another modern touch for a town steeped in history. Before Highway 27 connected San José to the Pacific coast, there was an old highway from La Sabana in west San José to Escazú to Santa Ana to Piedades to Villa Colón and beyond — originally an oxcart trail in which the towns were said to be spaced a day’s journey apart. In the old days the roads were unpaved, the rivers had no bridges, the land was undeveloped and a lot of people got around on horseback. Today this stretch is lined with prime commercial and residential real estate. Old-timers who grew up here say the pecking order of social status started in Escazú to the east and went downhill from there to the west. A lot of people in Santa Ana described themselves as cebolleros, “onion farmers,” but people from Escazú sometimes used the word like a taunt. The cebolleros eventually got even by trading in their onion fields for some of the most exclusive condominium complexes in Costa Rica. But their revenge backfired a bit when the nouveaux riches santaneños found their new BMWs stuck in infuriating traffic jams, especially along the Lindora road between Santa Ana and Belén. Traffic moves past the businesses on Lindora Road. Though the term is somewhat vaguely defined, Valle del Sol (“Valley of the Sun”) is a traditional name for the Santa Ana area that was officially adopted in 1971. Santa Ana is the name of both the principal city and the canton, which was found to have close to 50,000 inhabitants in a 2011 census. The districts within the canton are Santa Ana, Salitral, Pozos, Uruca, Piedades and Brasil. Of these, Pozos (home to the jam-packed Lindora road) is the most populous. The canton of Santa Ana encompasses just over 60 square kilometers, and its centralized location between San José and the coast is a big draw for many. A golfer takes a swing at the Valle del Sol Golf Course. The Sunday morning farmer’s market in downtown Santa Ana is very popular, as is the Tuesday evening organic market in nearby Ciudad Colón. 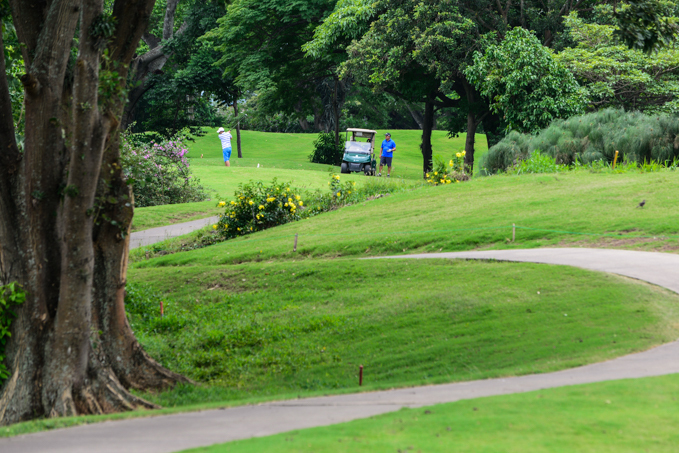 You can go golfing or play tennis at Parque Valle del Sol. You can catch a film at one of two new movie theaters. You can visit either of two animal sanctuaries. Drive 10 minutes south of Santa Ana and you’ll be climbing a mountainside that in most places is too steep to build on, so it’s covered in Costa Rica-style emerald forest. Not that you’re likely to see one, but there are mountain lions in these hills. Just look at a Google map, and south of town you’ll see a vast area of green mountains where roads and towns are almost non-existent. This being Costa Rica, that means the area is teeming with birds, mammals, reptiles and other wildlife. 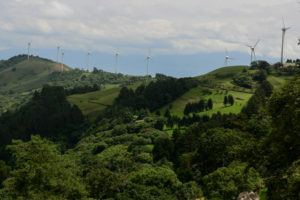 Wind turbines above the Valle del Sol generate power for the Central Valley. The ridge known as “Las Eólicas” (“The Windmills”) is a popular picnicking and hiking area, and there are typically great views on the way up, though you may soon find yourself in the clouds, unable to see anything below. Santa Ana has some standout hotels, including one that displays one of the finest private art collections in Costa Rica. Some of the top hotels, and some of the dozens of excellent restaurants, will be reviewed in a future article in this series. Santa Ana may not have a beach, a volcano or a chocolate tour, yet it’s a fascinating window into the genuine Costa Rica, past and present, the kind of place where people want to live after they’ve visited the rest of the country. Rich as it is in history, in many ways Santa Ana represents the future of Costa Rica. Tourists will always head to the beaches, but close to three-fourths of its citizens will continue to live in the Central Valley. Santa Ana, in places, may increasingly look like Miami, with gleaming glass office towers, tech companies, luxury hotels and expensive restaurants. But it will always be hemmed in by green mountains, and there will always be chickens, turkeys and pigs. This article, one in a series on “Costa Rica’s Least Known Greatest Places,” is sponsored by Hotel Alta Las Palomas, a boutique luxury hotel between Santa Ana and Escazú, featuring the award-winning La Luz Restaurant. Contact Hotel Alta at info@thealtahotel.com or at 2282-4160. 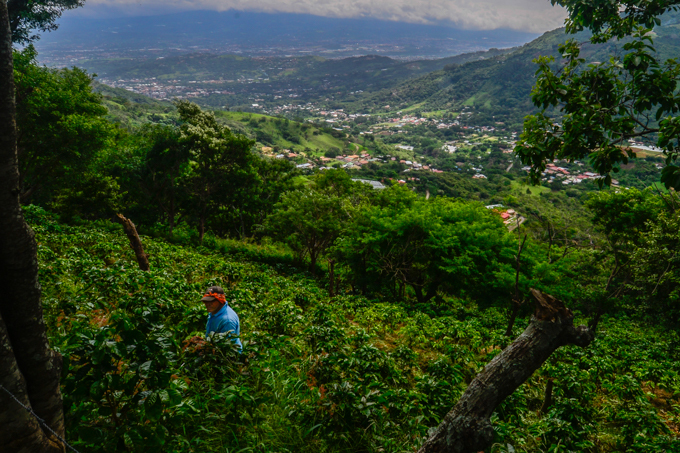 A coffee farmer weeds the fields on a mountainside overlooking the Valle del Sol.